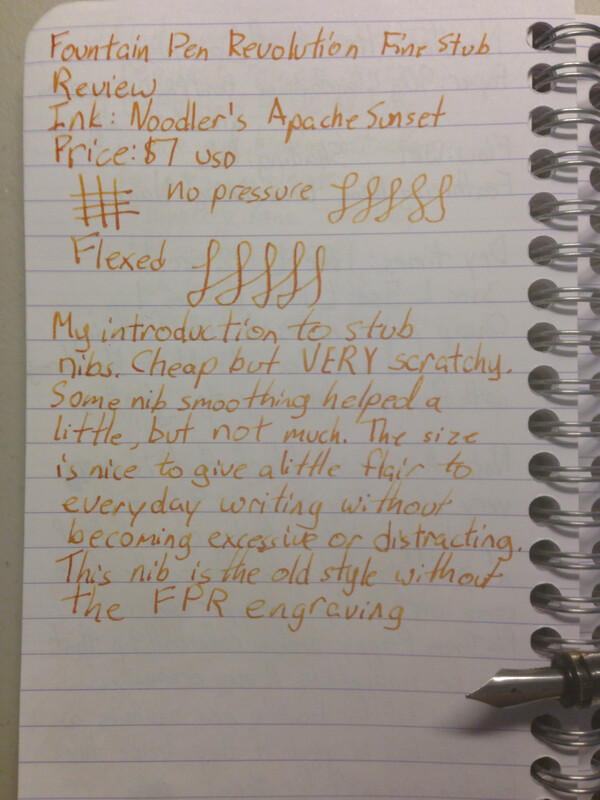 A short handwritten review of the Fountain Pen Revolution Fine Stub Nib. 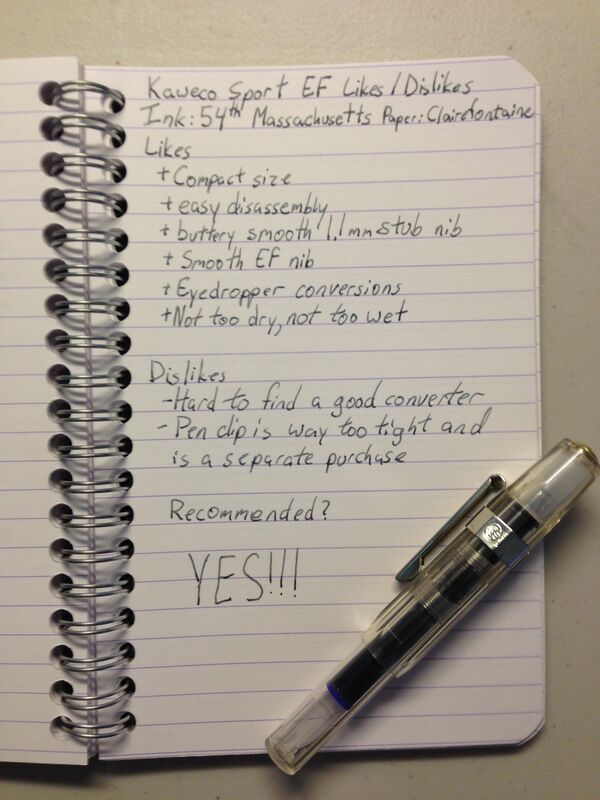 The nib is a #5 nib size and will fit pens like the TWSBI Diamond and all of FPR’s offerings. Personally, I wouldn’t recommend the nib unless you really want a fine stub nib and are unwilling to grind your own. The nib is insanely scratchy compared to FPR’s other nib offerings. There are better priced stub nibs that are much smoother. My introduction to stub nibs. Cheap but VERY scratchy. Some nib smoothing helped a little, but not much. The Size is nice to give a little flair to every day writing without becoming excessive or distracting. This nib is the old style without the FPR engraving. The Kaweco Sport is a pen designed to be as small as possible when closed for easy storage in pockets, bags, purses, and so forth. When capped, the pen expands to a small pen that fits comfortably in the hand. The pen is available in plastic and aluminium in a wide variety of colours. The pen is built like a linebacker. The thickest part of the cap measures in at 1.5 cm and the body measures 1.1 cm in diameter. When capped, the entire pen measures 10.6 cm in length. From nib to end, the body is a measly 10 cm. I have really small hands, so I find writing with the Kaweco Sport uncapped to be perfectly comfortable, but I believe most people will want to write with the pen capped. When capped, the pen is 13 cm long. I found the small size is perfect for sticking in jacket pockets and on the outside pouch of backpacks. Because the pen is so small, most user’s grips will sit on the threads of the pen. The threads are not sharp at all and are actually pretty comfortable to hold. Disassembling the pen is very easy. The nib and feed is friction fit and best removed with a rubber grip pad. The barrel is one single piece which makes the Kaweco Sport a popular choice for converting into an eyedropper pen with a little bit of silicone grease. For people who prefer cartridges and converters, the Sport accepts the standard international short cartridge. Some people have had luck with using the Monteverde Mini converter, but I found it was too loose and could not make a seal to draw up ink. Kaweco offers a squeeze converter for those who like them. Personally, I have been refilling the short cartridges with a blunt syringe. The Kaweco Sport accepts Kaweco nibs from extra fine to 1.5 mm stubs. The stainless steel nibs come in silver or gold colouring. The standard Kaweco Sport line comes with gold coloured nibs will the ICE editions come with silver coloured nibs. Although a standard #5 nib fits the feed, they are too long and will stop the cap from screwing in. As Kaweco is a German company, nib sizing is European. A pen clip can be purchased separately. I found pen clip to be extremely tight. Trying to slip it into the pen slots in my jacket pocket often resulted in the pen clip being pushed off the pen. I have a 1.1 mm stub and an extra fine nib for the Sport. The 1.1 mm stub is buttery smooth. My previous experience with a stub nib was rather scratchy and even after extensive tuning, I still haven’t quite smoothed out all the edges. Normally, I’m a huge fan of extra fine nibs. The finer, the better! However, the Kaweco Sport’s 1.1 mm stub sold me on the experience of using stubs! The extra fine nib is smooth for an extra fine, but does have a bit of feedback to it. The ink flow is very well balanced, if not a little on the wetter side of the spectrum. The pen cap has an inner cap that does a pretty good job of slowing evaporation of ink when left unused. Since the pen lives in my jacket, I was rather worried about ink leaking from the pen. 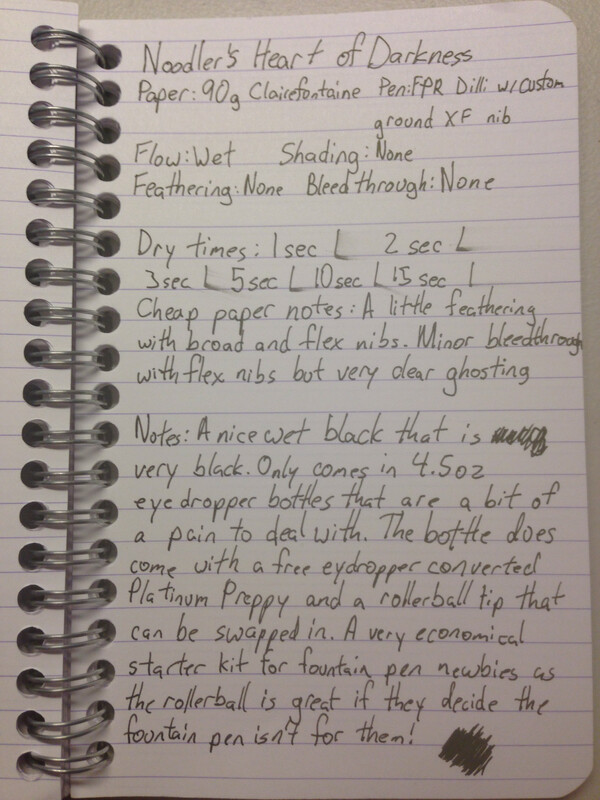 I tested how water tight the cap was by pouring some water into the cap of the pen then screwing in the body of the pen. For the most part, water did not escape the cap. If the pen was shaken extremely vigorously, then water trapped between the inner cap and the outer cap would leak. However, the level of force used to cause ink to escape the cap was really high, I don’t see myself experiencing that level of force short of being caught in a bad car accident.